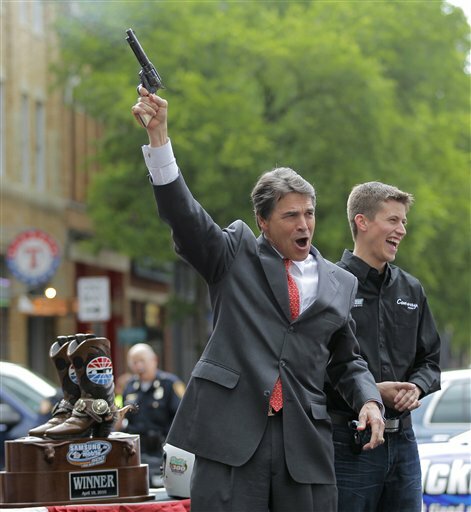 Texas Governor Rick Perry fires a six shooter at an event in Fort Worth. Photo by Rodger Mallison / AP. From the annals of bad ideas: the Texas legislature is poised to pass a bill that will make it legal for both students and professors to carry concealed handguns on college campuses, in the name of self-defense. More than half the members of the Texas House have signed on as co-authors of a measure directing universities to allow concealed handguns. The Senate passed a similar bill in 2009 and is expected to do so again. Republican Gov. Rick Perry, who sometimes packs a pistol when he jogs, has said he's in favor of the idea. I was there that day. It was the craziest day of my life with one person walking around with two guns," Goddard said. "I can't even imagine what it would have been like with multiple students and multiple guns." Another group against the bill? Leaders of Texas' own community colleges. Collin College chief of police Ed Leathers says he is a supporter of Texas' concealed handgun laws, and even has a concealed handgun license himself. But he adds that “Our officers are trained to go immediately to the location of where shots are reported to be fired, and they’re trained not to ask any questions but stop the person who they identify with a weapon” -- possibly causing confusion about who the criminal is, which could have tragic consequences.